This is what I've been working on this week, and will be working on through the rest of this week, some work I need to submit before some deadlines. But I don't hate deadlines---in fact, I'm guessing I would get very little done without them. And, looking for a non-copyrighted image to illustrate this post, I realized I need to make my own image. And Someday*** I will come up with an image for "deadline." However, since I am on deadline for these other projects, I won't do it right now. 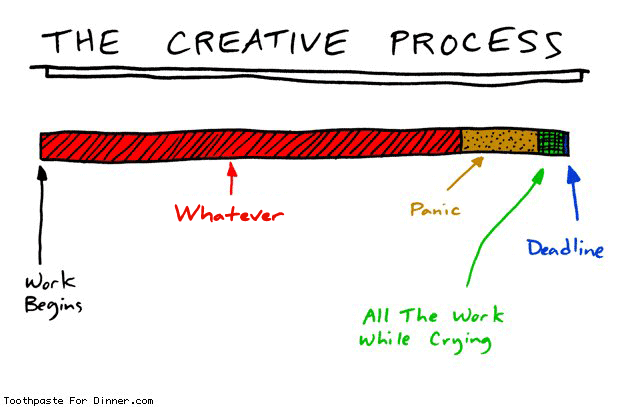 But I *AM* going to post here a link to this blog post, "How to excel despite deadline stress," which has a great illustration. *** I capitalized "Someday" because it's like it's a regular day of the week for me, like Sunday, Monday, and so on. Maybe I could also call it "Everyday." Or "Deadlineday."